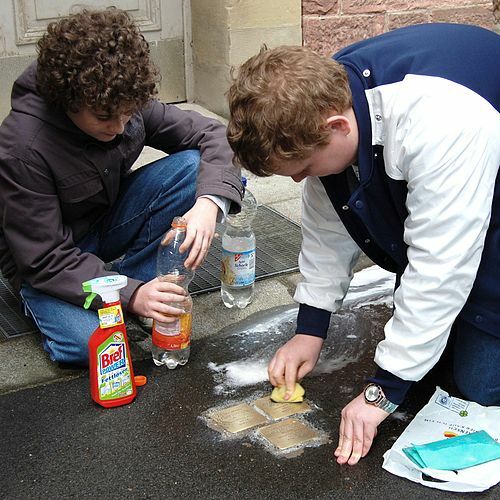 “Stumbling blocks” (in German, Stolpersteine) are unobtrusive reminders of the Nazi past. These small squares of concrete (about 4 x 4 inches), covered with a thin brass plate, are embedded in the sidewalks of Berlin and hundreds of other German cities, as well as locations in other European countries. Each of these stones bears a simple inscription giving the name of an individual victim of the Nazi dictatorship who lived in the house or building in front of which the stone has been set as well as details about this individual’s fate. Most of the victims are Jewish but these stones also draw attention to the fate of Sinti and Roma, gay men and women, mentally or physically handicapped people, Jehovah’s witnesses, political opponents of the Nazis, and German soldiers who deserted at the end of the war. Demnig’s project asks Germans to take an active role in the reconstruction of the Nazi past of their own cities and localities. 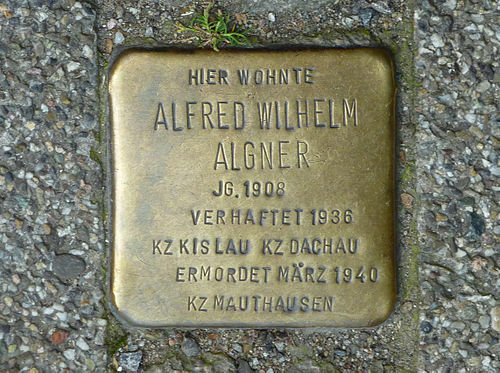 Demnig sets stumbling stones in the pavement only on the invitation of local organizations or groups of citizens who have developed an interest in his project and who have researched the histories of the victims who are to be remembered with these stones. Placing these stumbling stones has sometimes provoked controversy. Some homeowners argue that a stone in front of their property may lower its value, a few city governments have refused to give the necessary permission, and some Jews have questioned whether stepping on the names of the victims is an appropriate way to remember them. Yet, Demnig’s project is constantly expanding. In a recent YouTube clip, Demnig claims to have now set more than 23,000 stones in over 500 German communities. “Stumbling Blocks” has also become a European project; examples of this “decentralized monument” can now be found not only in Germany, but also in Austria, Belgium, the Czech Republic, Hungary, Italy, the Netherlands, Norway, Poland and Ukraine.